Discard any broken-shell or open (dead) mussels and clams. Scrub remaining mussels and clams in cold water, removing any barnacles with a dull paring knife. Remove beards from mussels. Place mussels and clams in large container. Cover with cool water. Agitate water with hand to remove sand; then drain and discard water. Repeat several times until water runs clear; drain. In small microwavable bowl, microwave 1/2 cup of the chicken broth uncovered on High 15 to 20 seconds or until hot. Place saffron in hot chicken broth; allow to rest about 5 minutes or until liquid is dark yellow. Set aside; do not discard saffron. 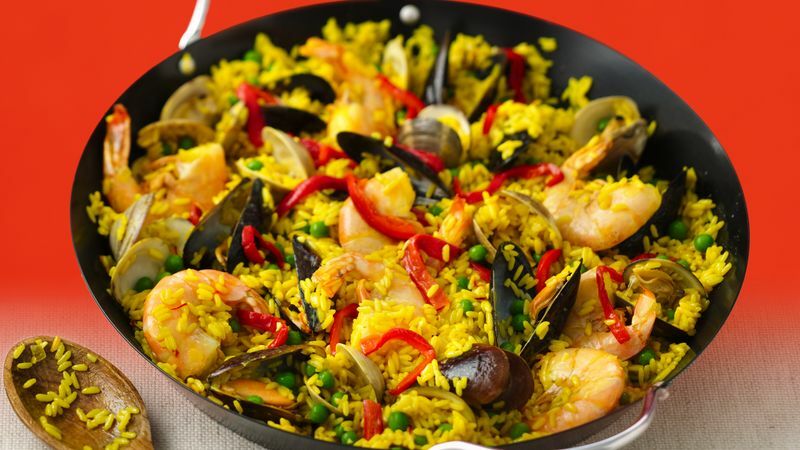 In 14-inch paella pan or 4-quart Dutch oven, heat oil over medium-high heat. Cook onion, garlic and rice in oil 1 to 2 minutes or until onion is soft. Add shrimp, mussels, clams, peas, parsley, remainder of chicken broth, salt and saffron-infused broth. Heat to boiling over medium-high heat. Reduce heat to medium-low. Cover pan with foil. Cover foil with a wet towel, making sure no edges of towel hang over sides of pan. Cook 20 to 25 minutes or until liquid is absorbed, clams and mussels are open, shrimp is pink and rice is cooked. Removed unopened clams or mussels, and discard. Garnish with roasted peppers. If desired add chorizo, chicken thighs and pork loin cubes to make it a favorite for all your guests.